With 42 international appearances, a World Twenty20 triumph, three County Championships, a T20 Cup and a Pro40 title to his name, Sussex and ex-England all-rounder Michael Yardy can approach his retirement with pride in his achievements. But away from Hove, Yardy may - however unfairly - find himself partly remembered for the matches he missed at the 2011 World Cup, when he returned home from the tournament because he was suffering from depression. The man himself though has learned to view his mental health issues as an integral part of who he is, and even as something which helped push his career on to greater heights, albeit at a cost. How his personality has shaped his career: "You're challenging yourself every day to improve, and you can't sit on your laurels. I've never been that type of person or had the talent to do that." His England career: "To play with guys like Kevin Pietersen was a treat, you had the best seat in the house for players who could do things against world-class bowlers that others can't." Sussex's winning ways: "I've been very lucky - since 2001 Sussex have always won trophies and the culture we had was that you kind of demand it from everyone because you're used to it." T20 v Test cricket: "Although I was more successful in one-day cricket, I'd have loved to have played in a Test match. I wasn't quite good enough but to me it's still the pinnacle and I hope that people still see that." "I think I've always been one of those people who just teetered on the edge over the last five years," the 34-year-old told BBC Sussex. "Cricket was a massive part of my life, but I think depression is something that's inside people, whatever profession you do. If you're put in a certain situation it will come out. "It's been difficult, but living on the edge has allowed me to do things that maybe people with more talent haven't done. I've always pushed myself in everything in my life, but you can push yourself too far, and I did. "But I wouldn't change anything for the world, it's inside me and I have had to live with it." Former England boss Peter Moores, who was Yardy's coach at Sussex, said the way the player "fronted up" to his problems was typical of the man. "He worked it through, came back and carried on and played some great cricket," he said. "Sometimes walking away from something is a brave decision. "He has got a lot of character and that came through in games. When it's tough, Mike Yardy stands up. He will look back on what has been a fantastic career." Yardy, who played every match when England won the World Twenty20 for the first and so far only time in 2010, said his decision to announce his retirement had ultimately come as a relief. "I just decided my time was up," he explained. "I'd thought about it since the start of the season and fought it a little bit but it felt like the right time. It was a relief but it's still difficult. "I've done it [cricket] for 16 years and enjoyed it and I realise now that I was privileged to do something I grew up loving. I'm sure it'll take a bit of time to get used to not playing, but I want to do something else with my life." That "something else" may well be rooted in matters of the mind, with Yardy set to spend the next two years completing a degree in sport psychology at Chichester University. 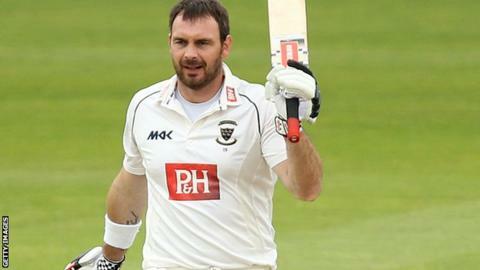 "I would love to work in other sports, but would also love to come back to Sussex at some point," he added. "It's good to get away, but it would be a dream to come back at some point on the coaching side of things." Read more on What is depression?